Before I started travelling around the world long-term, I lived all of my life in the beautiful country of Switzerland. Since I was a little kid, my parents always took me on Switzerland winter holidays to the Alps. At about six years old I stood on a pair of skis for the first time, and when I was around 18 I changed to a snowboard. I can promise you that there are so many great things to do in Switzerland in winter! Because of this, the mountains became my second home and I always loved our holidays there. Let me tell you: If there is one cliché really true about Switzerland, then it’s the one that it has some of the most awesome winter holiday destinations in the whole world! So, let me show you where in my home country you can find the best Switzerland winter holidays. Zermatt is, without doubt, one of the most awesome winter destinations in the world. There, you’ll not only find the highest ski area in the Alps (4000 metres above sea level), but also one of the most romantic towns in the Swiss Alps right in front of the majestic Mount Matterhorn. Snowboarder and skiers both profit from the year-round guaranteed snow conditions in the best-developed and most extensive ski resort in the world. The Matterhorn Ski Paradise offers over 360 km of winter-long white slopes and 52 installations, like ski lifts or gondolas. You can even pre-order your ticket stress-free online. There is still so much else to do, even if you don’t ski! For example, you can take the Gornergrat mountain-train up to 3084 meters above sea level and enjoy the fantastic view, or have a drink in the cool-in-more-ways-than-one Iglu-Village. We went to Zermatt with the Glacier-Express, which made the whole trip an unforgettable experience. No matter what you decide to do, we’re sure that you will love your time in one of the best ski resorts in Switzerland. Check out our guide of where to stay in Zermatt. Since the two spectacular and well-loved Swiss winter destinations Arosa and Lenzerheide merged together, Switzerland has a new super ski resort which offers something for just about everyone. There are over 225 km of slopes and 42 ski lifts/gondolas which create the perfect winter sports arena. There are slopes for every level of expertise, and even freestylers will find some perfect spots. While Lenzerheide is perfect to celebrate in bars into the early mornings, Arosa is the place to see and be seen. Don’t be surprised if you meet a celebrity there. If you’re looking for other activities than skiing, then how about a scenic walk on a winter trail or a romantic horse-drawn sleigh ride? A highlight, especially for children, is the “Eichhörnchenweg” (squirrel path). There you can meet tame squirrels along the trails of this beloved forest. No matter what you decide to do in Arosa or Lenzerheide, make sure you’ve got all the necessary items from the winter packing list with you. This is one of my personal favourite places to spend my Switzerland winter holidays. The whole town is car-free and the only vehicles on the streets are the ski-buses which bring you free of charge to the mountain railways. Together with the neighbouring towns Saas-Grund and Saas-Almagell, the Free Republic of Holidays Saas-Fee offers more than 150 km of slopes, 60 km of winter hiking trails and 20 km of toboggan runs. We recommend this destination especially for snowboarders who love freeriding and freestyling. Of course, Saas Fee also offers great attractions for non-skiers, like for example the Allalin Ice Pavillon or the restaurant called “threes!xty”, which is both the highest revolving restaurant in the world and the highest restaurant in Switzerland. Check out this post about the best things to do in Saas Fee if you want to know more. If you like to party, then we can recommend you Popcorn and Poison, where you can spend some great aprés-ski nights out. All this variety makes Saas Fee my favourite Swiss winter destination. St. Moritz in the region of Engadin is probably the one Swiss winter destination which is most associated with luxury and the jet-set life. But this beautiful town offers much from its surroundings – over three thousand meter high mountains, an impressive glacier world, and scenic mountain lakes. All so much more than just material luxury. The ski region of Engadin, the valley in which St. Moritz is situated, sports more than 330 km of slopes for every level of expertise. The Engadin Valley is also one of the best cross-country skiing destinations in the whole world. In winter, there are cross-country skiing trails with a total length of over 230 km. Furthermore, there are some impressive winter hiking trails just waiting to be explored. St.Moritz might not be the cheapest way to spend your winter holidays in Switzerland, but it is definitely one of the most luxurious Swiss winter destinations for five-star travellers and adventure seekers alike. Davos-Klosters is one of the best-known winter holiday destinations in the whole world. While the town of Davos is very urban and vibrant, Klosters is a lot more idyllic and peaceful. What those places have in common is that they are some of the best towns to spend the winter holidays in Switzerland. The ski region of Davos-Klosters includes six individual ski areas, each with its own focus. The Jakobshorn has a huge Snowpark which will make freestylers extremely happy. Freeriders will find their nirvana off-piste in the ski area of Pischa. If you are travelling with children or less confident riders, then you should definitely check out the Madrisa area with its gentle hills. And then there is of course also a real Ski-Eldorado in form of the Parsenn and Rinerhorn regions. For the brave, there is even the option for a tandem paragliding flight! On a side note: Only a 15-minute long bus ride away from Davos you can find one of the highest breweries of Europe, called BierVision. They offer brewery tours and other amazing experiences, for example, a brewing workshop. You can find out more on their homepage. Flims, Laax, and Falera together form the biggest contiguous ski area in the Swiss canton of Graubünden. This Swiss winter destination is probably the best ski resort for snowboarders and freeriders. With its deep powder snow zones and the many snowparks, it’s a dream for every freeride-lover! One of the highlights is definitely the biggest halfpipe in Europe, found at Crap Sogn Gion. Other highlights are the 17km long descent from the highest point of the ski area (Vorabgletscher) and the diversified cross-country skiing trails. Those travelling with kids will appreciate the extensive childcare on offer. If you prefer calmer holidays, then we recommend going to Falera. There might not be so many slopes, but therefore you’ll find scenic winter hiking trails and more sun than in the other two areas. If you prefer to stay in Central Switzerland, then you should definitely have a look at Engelberg in the canton of Obwalden. Some might even have heard of it before as it is the venue of the annual World Cup of ski jumpers. Engelberg, with its mountain Titlis (3,239 m), is considered a true freeriders paradise, where skiers and snowboarders from all over the world flock for skiing holidays in Switzerland. Thanks to glaciers, the Engelberg-Titlis holiday area offers assured snow from October to May, with a fantastic view over the rugged cliffs of the surrounding Alpine peaks. Numerous cross-country trails and toboggan runs, as well as beautiful hiking trails and snowshoe trails, also offer good alternatives to the fantastic alpine skiing in Engelberg. Some of the highlights are the world’s first rotating cable car (Titlis Rotair), a glacier grotto and a slide park with snow tubing. You can prebook a bundle with a return ticket for the gondola and admission to the glacier grotto here. There is also an igloo village and Europe’s highest-altitude suspension bridge. It’s very easy to describe Adelboden Lenk in one word: perfect. The combination of the breathtaking landscape, the first-class leisure facilities, and the perfectly prepared and varied slopes make this ski resort a dreamlike paradise for skiers and snowboarders alike. The two towns of Adelboden and Lenk are completely interconnected and it’s super easy to get from one town into the other with the many ski-buses. 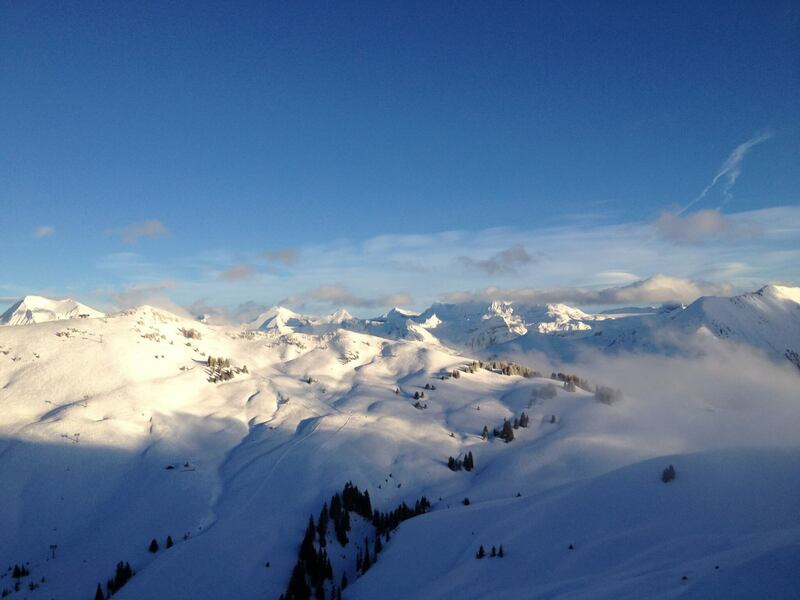 Adelboden-Lenk is especially suited for beginner and intermediates but also sports some black slopes for experts. The ski resort even offers a snowpark with various kickers, boxes, and rails. We can also recommend this ski resort for the magnificent panoramas and vistas. Adelboden-Lenk definitely has the potential for the best Switzerland winter holidays. Gstaad, which boasts hearty après-ski with a sophisticated flair, is another snow paradise in Switzerland in the canton of Bern. Together with other ski resorts in the same valley, it forms the ski region called “Gstaad Mountain Rides”. This ski region consists of six single ski areas which are called sectors. While the best alpine slopes are in sector 1 between Saanen and Saanenmöser, a snow safe paradise for snowboarders and freeriders in the form of a glacier is waiting on the Glacier 3000. The ski region is also equipped with around 175 km of cross-country skiing trails. Furthermore, there are two snowparks with kickers, tables and a quarterpipe. Ski buses and trains take you comfortably to the individual ski mountains and up to the cable cars at Glacier 3000. There is also a great offer for a Glacier 3000 Ticket Including Cable Car and Peak Walk. The ski region of “Les Quatres Vallées” (the 4 Valleys) lies in the French-speaking part of the country and is the largest Swiss ski resort. The four valleys offer some of the best winter holidays in Switzerland. Verbier is the pulsating centre of the region and on the higher end of the price range. The smaller towns like Veysonnaz, Thyon-Les Collons, Nendaz or La Tzoumaz are a bit cheaper and still offer good facilities. If you are a snowboarder, then make sure to head to La Tzoumaz, as it is a proper snowboarders paradise. Thanks to sophisticated, modern lift and cable car systems, it does not matter in which of the ski resorts you are looking for accommodation as all slopes in the region of Les Quatres Vallées can be reached from any location within the skiing day. There are three snow parks (halfpipe included), beautiful hiking trails, toboggan slopes and much more. One of the highlights is definitely the highest igloo-bar in Europe on the Mont Fort (3329m). I hope this provides you with some insights into the top 10 exciting Swiss winter destinations. Hopefully, you even found a dream destination for your next winter holidays in Switzerland. If you’re interested in reading more winter-related articles, then click to read our other winter-themed posts. Also, if you are like us and love to write down your memories after a busy day in the Alps, then check out these great travel journals to write down your adventures in style. And a little tip at the end, if your wallet is not big enough for winter holidays in Switzerland, then check out Bavaria in Germany. Do you have a favourite Switzerland winter destination? Then let us know in the comments. We always love to discover new places! As the owner of 4vallees4saisons, La Tzoumaz’ largest accommodation provider, I believe it is very important to accurately describe such details! Thank you for your attention. Thank you very much for your comment and for showing me this factual error. I will change this immediately.